Great writing skills start right at home. Sometimes, the simple items that you have sitting around the house are all you need to begin building learning skills that last a lifetime. NoTimeForFlashcards.com founder Allison McDonald came up with this quick and easy reading activity for kids that teaches basic rhyme – while also providing a fun time! Check out these simple steps below. Step 1 – Gather your materials. Step 2 – Test it out. Make sure your thumbtacks are secured when pushed into your box. 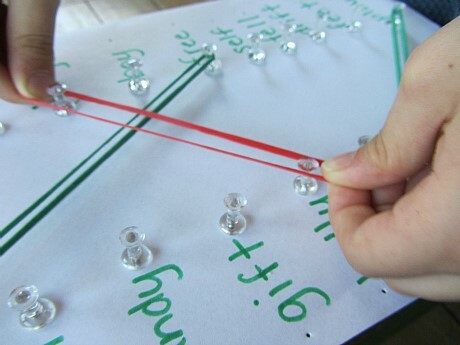 Test out how far apart you can make the thumbtacks and stretch your elastics so they stretch… but aren’t so tight that they don’t turn the tacks into projectiles! We’re teaching children about rhyming here, not about flying! Step 3 – Choose your words. Write out a list of words on the right side of the board. On the left side, choose a list of words that rhyme with those words and place them in a random order. Make your word selection fun! Try and theme it based on the current season, an upcoming holiday or anything else fun that’s occurring when you create your game. Step 4 – Glue (or tape) your list to the box. Remember, don’t place them too far apart! Step 6 – Enjoy rhyming! This is a fast activity, but it’s designed to be that way! It’s a quick way of learning critical skills while having fun in the process. Here at Take Pride Learning, we love unique ways that help develop the motor skills of today’s children.